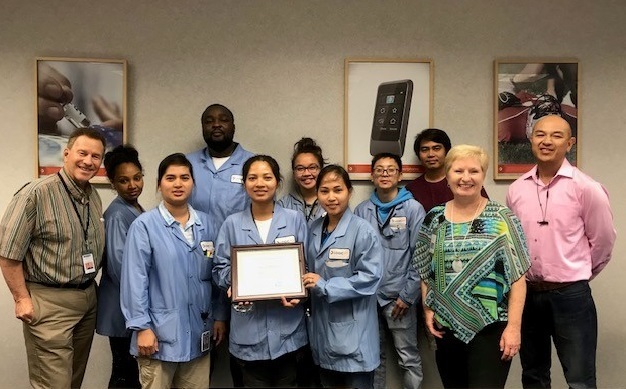 Electronics Manufacturing Services (EMS) and Design & Engineering company Logic PD kicked off its new apprenticeship program this week as the first class of 10 employees entered their initial phase of manufacturing skills training. Designed in collaboration with the Minnesota Apprenticeship Initiative (MAI), a partnership between the Minnesota Department of Labor and Industry and the Minnesota Department of Employment and Economic Development, Logic PD’s apprenticeship program aims to “graduate” 135 apprentices over the next two years. The apprenticeship program is open to new and existing Logic PD employees working in process operations or in material handling positions at the company’s advanced manufacturing worksite in Eden Prairie, Minn. The program, which takes 18 months to complete, combines classroom training in industry-specific skills, quality assurance instruction and 2,000 hours of structured on-the-job training and mentoring. Logic PD plans to begin training new apprentice groupings every 60 days for the next two years. Progress milestones include passing a combination of skills evaluations and written tests. Wage increases will be granted in the mid-point and end of the training. Upon completion of the program, apprentices will have earned nationally-recognized credentials that will reflect the advancement of their skills and training. Some apprentices will earn IPC-A-610 Acceptability of Electronics Assemblies Certification; others will finish the program as IPC J-STD-001 certified solderers for electrical and electronic assemblies. Visit https://www.logicpd.com/careers to learn more about the process operator and material handler positions that feed candidates into the apprenticeship program.